TAIWAN: A consortium of Macquarie Capital, Swancor Renewable and Ørsted have arranged TWD 18.7 billion ($628 million) in financing for the 120MW Formosa 1 phase two project. Danish firm Ørsted said it was the first utility-scale offshore wind project to be financed in Taiwan. As part of the arrangement, the two-turbine 8MW first pilot phase of the project will also be refinanced. The financial backers comprise four local Taiwanese banks: Cathay United Bank, Taipei Fubon Commercial Bank, EnTie Commercial Bank, and KGI Bank. The banking consortium comprises a further seven international banks: ANZ Banking Group, BNP Paribas, Crédit Agricole Corporate and Investment Bank, DBS Bank, ING Bank, MUFJ Bank and Société Générale. 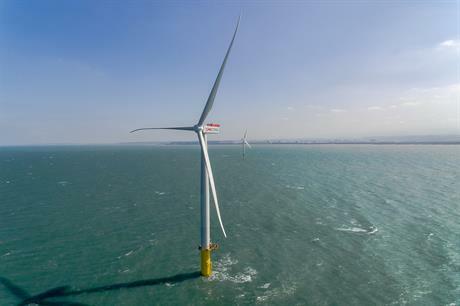 In April, Ørsted made its financial commitment to the 20-turbine project in a move to demonstrate its commitment to the project to Taiwanese authorities. Siemens Gamesa Renewable Energy will supply its SWT-6.0-154 turbine to the second phase, after providing the two 4MW turbines in the pilot stage. It is expected online by 2020. Taiwan is currently the offshore wind industry hotspot, with an influx of western companies taking an interest in the favourable policies there. In April, Taiwan's Ministry of Economic Affairs allocated grid capacity for ten offshore wind projects totalling 3.8GW. Successful developers included Danish firms Ørsted and Copenhagen Infrastructure Partners, Germany-based Wpd, Canada's Northland Power and Chinese group China Steel Corporation.